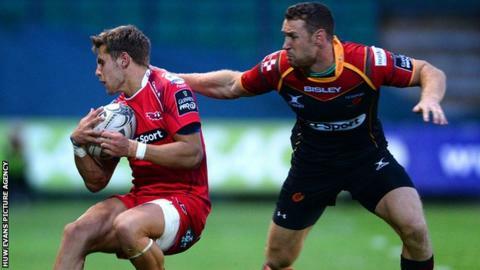 Scarlets ran in four tries to beat Welsh rivals Newport Gwent Dragons in a pre-season friendly at Rodney Parade. Tries from Tom Prydie and Rhys Thomas put Dragons ahead 13-5 at the interval with Gareth Owen replying. Jack Dixon extended the hosts lead before two tries from Tom Williams and another from Dan Jones secured victory for Scarlets. Scarlets host Bedford while Dragons visit Cardiff Blues in final pre-season games on 29 August.